Trigonotarbids are extinct little predatory creatures related to the spiders, mites, and scorpions. They resemble spiders in habit and behaviour but did not produce silk. (For details and reconstruction see .) Their exuviae shed in moulting are well-known fossils in the Rhynie chert. 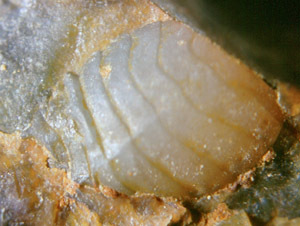 They are incidentally seen on cut faces (Fig.1) and in rare cases as a relief on the surface of the chert sample (Fig.2). 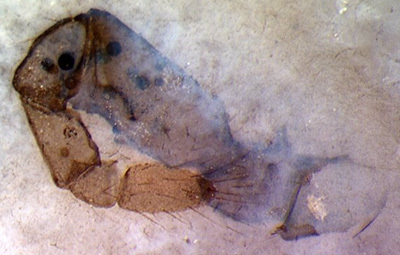 Fig.1: Exuviae silicified within a hollow straw of Aglaophyton where the trigonotarbid probably hid for moulting; body cross section with agate banding, width 2mm; disarranged legs and other parts nearby. Width of the picture 6mm. 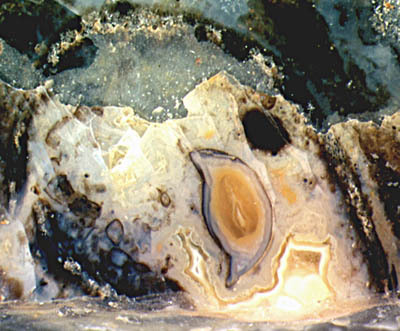 Fig.2: Trigonotarbid body, ventral side, with distinctly seen superficial segmentation, on the raw outside of a Rhynie chert sample. Width of the picture 3.4mm. 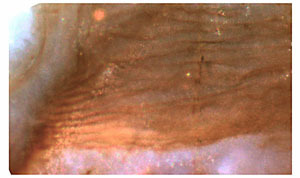 Fig.3 (below): Moult of trigonotarbid leg consisting of 7 parts, with bristles. Width of the picture 1.5 mm. Photographs (Figs.1,3) by H. Sahm . As a primitive feature, the bulky body shows the superficial segmentation which has been lost in nearly all extant spiders. The articulated hairy legs are made up of the same parts as the spiders' (Fig.3). 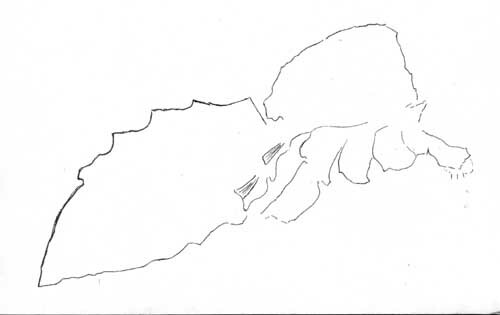 In addition to the three species identified in the chert hitherto there are rare sightings of comparatively huge specimens, as a still undescribed one shown in . One of those which are much larger than usual is seen in lengthwise section in Fig.4. As it is preserved as a whole among prostrate shoots and an immature sporangium of Aglaophyton, it was probably drowned in the flooding which also flattened the vegetation. Fig.4: Lengthwise section and related drawing of an uncommonly large trigonotarbid among flattened vegetation, total length without legs 9mm. Note the very faintly seen level bands inside the body parts near the bottom, suggesting preservation in a natural position. Width of the picture 10mm. Fig.5 (below far left): Book lung with lamellae attached to the enclosure on the left; detail of Fig.4. Width of the picture 0.35mm. Fig.6 (below): Book lungs in each of the first two segments of the rear part of the body, see drawing of Fig.4;. Width of the picture 1.7mm. Surprisingly, the so-called book lungs made up of a stack of lamellae are well preserved (Fig.5). Pictures of trigonotarbid book lungs have been shown before [1,2] but seem to be scarce, and the present one reveals some detail not seen in the aforementioned ones: There are two stacks of lamellae, in fact two lungs, one behind the other (Fig.6), as a relic of the more distinct segmentation of the trigonotarbids' ancestors. Remarkable is also the apparently narrow waist as seen on the outline in Fig.4 since the body of trigonotarbids allegedly does not look clearly subdivided into a front and rear part. 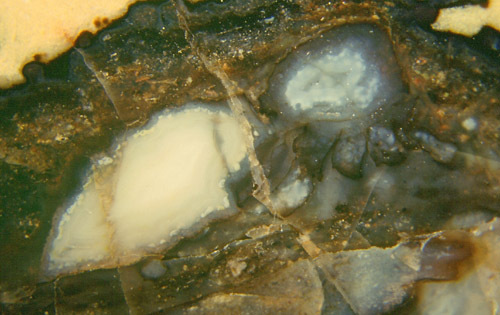 The pictures have been taken from 4 Rhynie chert samples. Grondboor & Hamer 58(2004), 33-51.